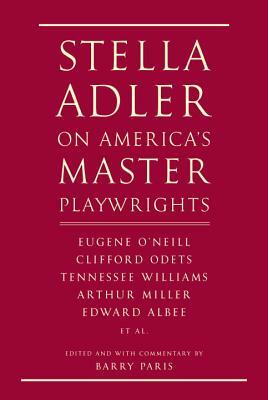 Stella Adler on America's Master Playwrights: Eugene O'Neill, Thornton Wilder, Clifford Odets, William Saroyan, Tennessee Williams, William Inge, Arthur Miller, Edward Albee (Hardcover) | The Drama Book Shop, Inc.
From one the most celebrated and influential acting teachers of her time, of all time, whose generations of students include Marlon Brando, Anthony Quinn, Eva Marie Saint, Diana Ross, Robert De Niro, Warren Beatty, Annette Benning, Peter Bogdanovich, Mark Ruffalo—the long-awaited companion volume to her book on the master European playwrights Ibsen, Strindberg, and Chekhov (“Evidence,” wrote John Guare, “that Stella Adler is hands down the greatest acting teacher America has produced . . . Nobody with a serious interest in the theater can afford to be without this book”). Adler saw script interpretation as the actor’s profession (“The most important thing you can teach actors is to understand plays”). Her classes of script analysis became legendary; brilliant revelations of the playwrights, the characters, the social class and the time of the play as opposed to one’s own. Adler explored how to find the ideas and experience them; how to search for the soul, for what is unsaid; all of this as a way of building craft as distinct from talent. Her new book, brilliantly edited by Barry Paris, brings together her most important lectures on America’s plays and playwrights, the giants of the twentieth century, men she knew, loved, and worked with. Adler considers, among them, Eugene O’Neill, Mourning Becomes Electra; his first play, Beyond the Horizon; and his last, Long Day’s Journey into Night (“O’Neill is a mystical playwright . . . his speech is vernacular, down-to-earth . . . it conveys the idea that there is nothing real outside, but that’s where I want to be—somewhere out in the fog. The answers are hard to get in a fog”) . . .
She writes about Tennessee Williams and The Glass Menagerie, A Streetcar Named Desire, Summer and Smoke, and The Lady of Larkspur Lotion (“Williams captivates us because of the romantic way in which he escapes the filth and frustration . . . The greatness in Williams is that [the characters] have a right to run away. What do they run away from? From the monster of commercialism and competition, from things that kill the melody and beauty of life”) . . . about Clifford Odets (“Clifford, if you don’t become a genius,” Adler once said to him, “I’ll never forgive you”); and about his plays Waiting for Lefty and Golden Boy (on Lorna Moon and Joe Bonaparte: “You can’t put a whore together with a Napoleonic man and think they’re going to make it. They might make it under certain conditions—but not from the point of view of love. This is not a love story. It’s a hate story”) . . . about William Inge and The Dark at the Top of the Stairs and Come Back, Little Sheba; about Arthur Miller, Death of a Salesman (“[The salesman’s sons] are Biff and Happy . . . They’re not George and Jacob. Their names are shortcuts. It’s the American Way—a way of saying, ‘We’ll leave out tradition’ . . . That tells you something you’ll see throughout the entire play: they are cut off from custom”) about Miller’s After the Fall; and Edward Albee’s The Zoo Story and The Death of Bessie Smith. Illuminating, revelatory, inspiring: Stella Adler at her electrifying best. STELLA ADLER began her life on the stage at the age of five in a production that starred her father, the legendary actor of the Yiddish Theatre, Jacob Adler. Stella Adler was one of the co-founders of the revolutionary Group Theatre. In 1934, she met and studied with Konstantin Stanislavski and began to give acting classes for other members of the Group, including Sanford Meisner and Elia Kazan. Adler established the Stella Adler Conservatory of Acting in 1949 and taught at Yale University. BARRY PARIS is the author of biographies of Louise Brooks and Greta Garbo. “Intoxicating . . . Paris has done a magnificent job. . . Most exhilarating is that the book brings back the sound of Stella’s unique voice and thought processes, as well as her own particular vision . . . Every sentence is a treasure. [The book is] about so much more than simply bringing to life the work of major artists; it is really the expression of a way of life, and of looking at art as something larger than life. Stella had a marvelous way of mixing erudition with down-to-earth realities, show business know-how with a few Yiddishisms, all combined with a vivid sense of what she called a theater of ‘heightened reality’. . . . this book brings her voice back quite viscerally. It’s Stella talking, taking you on her particular roller-coaster ride through the playwrights and their characters, with an occasional anecdote or comment about her most famous student, Marlon Brando. “We usually go to scholars, dramaturgs, and critics for detailed analyses of the modern American theatre. Well, forget that! Here in this amazing book is Stella Adler in full and insightful bloom, preaching, exhorting, insulting, provoking, and always helping her many acting students. Through character study and scene breakdown within a specific play, she manages to give us a personal tour of the times and lives of the 20th Century’s most illustrious playwrights. She knew them, she knew the world they lived in, and she remembers EVERYTHING!